Lone Filipino Olympic boxer Mark Anthony Barriga took advantage of his speed and counterpunching and won over Italian Manuel Cappai, 17-7, to advance to the round of 16 of the men's lightflyweight (49 kgs). Barriga was very dominating at the onset of the fight with the referee giving Cappai a standing eight count in the final 15 seconds due to a telling blow by the Davao boxer. The Filipino controlled the first round, 5-2. In the second round, Barriga’s defense did well on Cappai’s hooking and locking of the Filipino’s fast hands to win again, 4-2 and total of 9-4 after two rounds. In the third and final round, Barriga, even forged big combinations to score, 8-3, as Cappai’s hands were too fragile to defend the Filipino onslaught to seal a 17-7 victory in the first round preliminaries. Barriga will face Kazakhstan's Birzhan Zhakypov in the round of 16, who won a close bout against Jeremy Baccu of France, 18-17. The Kazakh won the bronze in the world amateur championships in 2005 and the silver in the 2010 Guangzhou Asian Games. The fight between Barriga and Zhakypov is scheduled on Saturday, August 4 at 8:45 pm, Manila time. Cuban Yosvany Soto, another favorite in the lightflyweight, easily defeated Australian Billy Ward, 26-4, to remain in strong contention for the gold medal. Soto will face defending Olympic champion and world amateur titlist Zou Shiming, who got a bye in the opening round. Another boxer with a lofty billing is Paddy Barnes of Ireland, the 2008 Beijing Games bronze medalist and reigning European champion, who also got a bye. 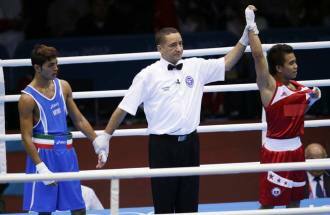 But Barriga had beaten him in the 2011 AIBA World Championships in a monumental upset a few months ago. This makes the Filipino lone boxer one of the favorites in the lightflyweight category. Barnes will face Thomas Essomba of Cameroon who outscored Abdelali Daraa of Morocco, 13-10. Other bouts in the lightflyweight round of 16 include Devendro Laishram of India fighting Serdamba Purevdorj of Mongolia, Jantony Ortiz Marcano of Puerto Rico boxing David Aryapetyan of Russia, Ramy Elawady of Egypt squaring off with Ferhat Pehlivan of Turkey, Carlos Quipo Pilataxi of Ecuador challenging Kaeo Pongprayoon of Thailand. Barriga’s win so far is the only positive result in the ongoing London Games as other Filipino athletes were eliminated in their respective events. All eyes of the country are now focused on the 19-year-old boxer from Panabo City who is set to hurdle all the odds going against him in his struggle for a medal in the 2012 Olympics.